Honoring Giftedness- Women in David Weber’s science fiction | J.W. Wartick -"Always Have a Reason"
David Weber is the author of a few New York Times Bestselling science fiction series. One, the Honor Harrington series, follows a woman who starts off as a captain of a starship sent on routine (and initially boring) missions. The second book in the series, The Honor of the Queen portrays its main character becoming involved in a wartime crisis between two nations with whom Honor’s home Kingdom is attempting to set up an alliance. There are SPOILERS for this book in what follows. The two nations are complementarian in nature. Complementarianism is the theological belief that men and women are “complementary” in roles, which means that men should be in charge in the church and home. I have discussed it and the rival view that women should be ordained/treated as equals (egalitarianism) at length elsewhere [scroll down to see other posts]. What really struck me is that David Weber fairly presented firm theistic believers as a spectrum. In the future, the Christian Church has continued to reform and have splinter groups form because of this. Weber’s presentation of the issue showed that believers–even some who might be considered extreme–can be reasoned with and even persuaded to believe differently based upon evidence. Furthermore, he showed that even those who may line up on the side with which he disagrees are not all (or even mostly) blinded by faith or foolishness. Rather, although there are some truly evil and disillusioned people, Weber shows that many are capable of changing their position or at least acknowledging that rival views are worth consideration. The exchange is characteristic of the way Grayson’s people are treated throughout the book. They are real people, capable of interacting with other views in honest ways. They feel challenged by a view contrary to their own. Some react poorly, and there are extremists who are blinded by hatred and anger. Yet all of them are treated as people with real concerns shaped by their upbringing and backgrounds. Weber thus allows for even ardent supporters of specific religious backgrounds to respond to reasoned argument and to change. They are capable of interacting on a human level and deserve every bit of respect as those who disagree with them. Again, there are those who are radicals and will not be reasoned with, but they are the minority and they do not win out. The dialogue presented in this book provides some interesting insight into facets of the present dialogue between complementarians and egalitarians. David Weber’s fictional character presented a challenge to the Grayson’s notions of what it meant to be a woman by being an excellent officer and professional. There are, it seems, real “Honor Harringtons” out there, challenging preconceived notions of what it is to be a woman. When, for example, a woman takes on the role of leadership in the church and succeeds, that should not be dismissed as a fluke, but rather a challenge to a paradigm which may itself be undercutting women’s ability to succeed. On a personal note, I have been challenged in exactly this way. When I was younger, I was a complementarian and was confronted by a woman who destroyed my presuppositions about what a woman “could do” spiritually. She showed that she could be a leader and present Christ to all without having to fit into role I defined for her. This real challenge caused me to realize that my notions of what a woman “should be” were themselves social constructs, not anything derived from the Bible. Like Yanakov, I had to rethink what my words and actions had done to perhaps limit the women around me. By God’s grace, this woman’s very existence forced me to rethink what I had assumed as truth and go back to God’s word to see where I had gone wrong. David Weber’s own presentation of Honor Harrington as a paradigm-shattering woman is something that hits close to home for me. For you, dear reader, I think it is worth considering the same: who has challenged your view of what they are “supposed to be”? Is your view of someone’s giftedness directly drawn from the Bible or is it something that you’ve just always assumed? As for me, I think we need more Honor Harringtons in our lives. Check out my posts on egalitarianism (scroll down for more). 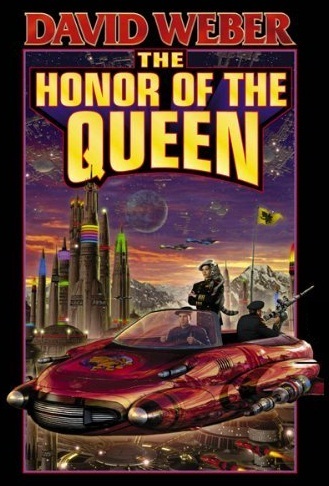 David Weber, The Honor of the Queen (New York: Baen, 1993). Weber’s presentation of the issue showed that believers–even some who might be considered extreme–can be reasoned with and even persuaded to believe differently based upon evidence. Brunner opened his analysis by acknowledging the importance of philosophy as a critical tool—a way of asking good questions, of probing the foundations of knowledge. Yet it must be recognized to have limits (Grenzen); limits that are defined by human reason—more precisely, human nature—itself. Philosophy, which fundamentally wishes to call everything into question, because it is only by doing so that it can be a basic discipline, dares not call into question one point, one certainty—namely, reason itself. It argues that reason is the only drilling tool with which we can work, and that we cannot drill into this tool itself. We cannot use reason to call reason into question. So when you say “believe differently based upon evidence”, does that mean the foundational “judging entity” (based on this thing called ‘reason’) remains the same? Enjoyed your review, J.W.! I haven’t read any of the Honorverse books, but have read one novella about her as a young officer, and enjoyed it far more than I expected to (I am not big into military sf). This sounds really interesting, and I will have to look into it. (I did try Weber’s “Off Armageddon Reef” recently, and couldn’t stick with it more than the first 100 pages or so – it quickly became very, very tedious and much more wanna-be high fantasy than space opera, which is what I was in the mood for). Thanks for stopping by, and thanks for the comment! I think it’s great when we have others who are able to reveal our underlying assumptions so effectively. It’s good to have an editor. I plan to dive into the “Off Armageddon Reef” series soon, I’m just finishing up the last of the Honor Harrington offshoots, which are decidedly not at all tedious and filled with awesome spaceships blowing up and political drama. I’m also curious to try Lois McMaster Bujold’s Verkorsian saga sometime. Have you read it? Recommend?